New Cayoz material, and this time he brought a few friends to rock over some Spanish influenced hip hop production. I didn’t realize that Cayoz’s production skills were so refined either. He definitely put together something proper with Letras Liquidos. One of the things that has been a MO of Cayoz is the fact that he puts together thought provoking music. But what gets lost in the translation sometimes is just how technically gifted he is as an emcee. 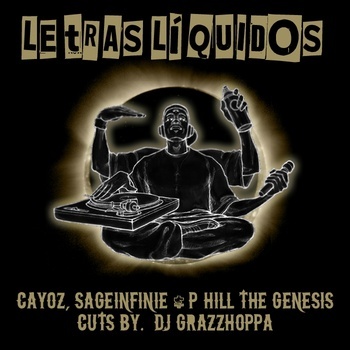 Sageinfinie and P Hill The Genesis both make solid contributions with their verse as well. And what can I say, that I have not already about DJ Grazzhoppa? I will say it again though for those of you who have not been listening: Grazzhoppa has the Midas Touch. If he is on the track, it’s going to be good.